Since our Z32 engines pump some serious power, almost all of us have been introduced to the rev limiter. 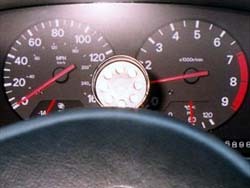 The rev limiter is the safety feature that cuts down RPMs when the limit is reached. 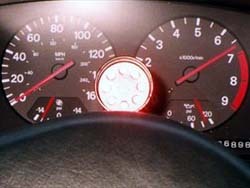 If you do much autocrossing, drag racing, or just like to gun it from time to time, a shift light might help you. The solution is to shift before the rev limiter kicks in, and having an adequate warning system could mean the difference between winning and losing. Installation of these products is relatively simple and requires no drilling and only standard tools. Before you begin, locate all the connections you will have to make, and consult your service manual. 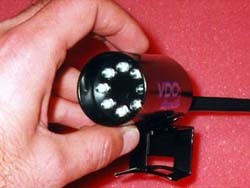 Note: VDO has just released its Mega-Lite, which has 8 red LEDs arranged in a circle with a switch to select high, low, or off. 4. 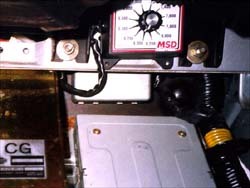 Take the MSD RPM Activated Switch, and look at it's wires. 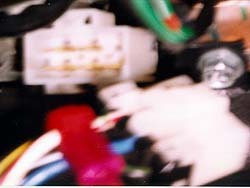 RED is +12V ignition switched power (draw power from WHITE wire @ WHITE harness by the steering column), YELLOW goes to VDO Mega-lite YELLOW, WHITE goes to the ECU YELLOW/RED, GRAY is unused. Black is ground - of course, and gives ground for the whole assembly. 5. Shift light has a RED and YELLOW, RED is for +12V power source, YELLOW goes to RPM Switch YELLOW. 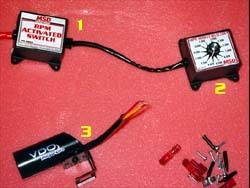 RED can be spliced into MSD RPM Activated Switch RED, and draw power from there. 6. Carefully extend wires, and place units at your liking. My light is sitting on top of the steering column (5. 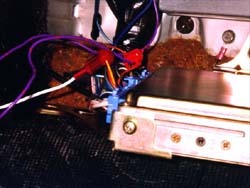 ), while MDS components are down by the ECU. RPM Activated Switch is invisible, it's tucked under the rail, where the red wire is (6. ).